In addition to the receiver, the person who’s giving a hug also benefits from its effects. And don’t forget…the positive benefits continue after physical contact. Who doesn’t like hugs? Well, we think hugs are fabulous. Most of you reading this will probably agree about the wonderful feelings hugs can create. But why do we like to embrace each other so much? In today’s article we’ll tell you about the power of hugs and explain some of the health benefits of both giving and receiving them. Hugs can come from anyone. It can be a friend, a family member, a loved one, your partner, or just a person who sympathizes with you. This embrace is considered a primal display of affection between human beings. Keep reading to discover the power of hugs. Studies have shown that hugs cause the brain to release endorphins. This leads to better healing throughout the entire body. In addition to that, an embrace is a form of therapy that generates feelings of well-being. Additionally, a good hug can reduce blood pressure or even potentially ease menstrual pain in women. A hug can also ease a headache and reduce anxiety, stress, or depression. The list of benefits are endless. It may build self-esteem, calm the nerves, remind you that you’re not alone, cure insomnia, etc. 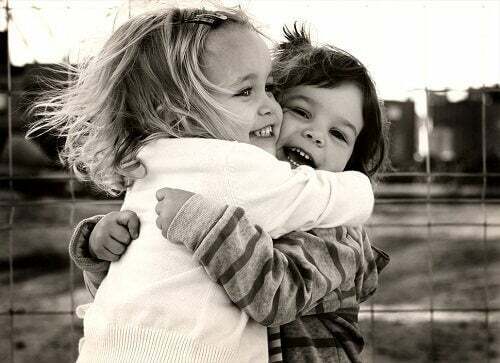 A hug can also help you overcome fear, stimulate the senses, bring you joy, and calm the soul. Hugging another person also has positive physiological benefits for the body. The secretion of oxytocin, a hormone, is one of them. Oxytocin is known as the attachment or bonding hormone, and it’s not just for children – it improves the quality of life in people regardless of what their age is. 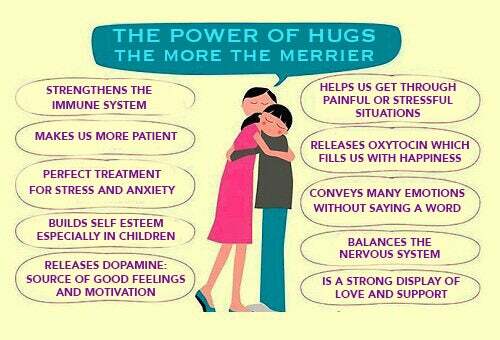 There are so many benefits of hugs that “hug therapy” is actually used to treat depression and other psychological disorders. Hugs also release other hormones like serotonin and dopamine, which have a sedative effect on the body. All of these effects together produce sensations of tranquility, wellness, and calm. But most interesting is that this effect is not only produced during the embrace, but can persist long after physical contact. One curious note is that scientific studies have shown that embraces and caresses have a greater effect on women than men. Still, both groups do benefit. Drawing on the book by Kathleen Keating, “Hug Therapy,” we can tell you that hugs don’t just make you feel good. They’re also essential to the mental and intellectual development of children, helping them overcome fears. Her book supports the anti-aging properties as well. Recap: why give and receive hugs? Protection: As human beings, we’re fragile, and we want to always feel protected. Nothing provides this better than a hug. Confidence: When you’re confident, you aren’t afraid to face the challenges that may arise during the day. After a good hug, nothing can stop you! Security: A feeling of security is essential to your daily life. You could even say it’s the fuel that helps generate the confidence needed to accomplish your goals. Strength: If you have strength within, you’ll share that energy with everyone you hug! Regardless of the meaning behind the embrace, everyone feels the physiological benefits that come with it. From a friend, a hug might just make you happy. But a hug from your partner may be “playful” or something more exhilarating. No matter what, never turn down a hug!